Exotic animal field guide: nonnative hoofed mammals in the United States. 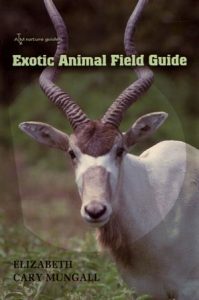 Featuring eighty different kinds of hoofed mammals, this field guide covers common exotics, such as Blackbuck antelope and Fallow deer, some less common species like Scimitar-horned oryx, and a few newer arrivals like Defassa waterbuck. The main portion of the book contains fully illustrated species accounts, with native range maps and information about food habits, habitat, temperament, breeding and birth seasons, and fencing needs. This book is for anyone who wants to identify and learn more about exotic wildlife in the United States. 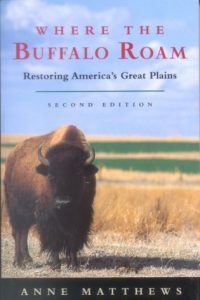 Where the buffalo roam: restoring America’s Great Plains. Pummeled by a century of drought, depopulation, and soil erosion, America’s Great Plains are in dire straits. With farms closing left and right, large parts of the region now have about the population they had in frontier days. Frank and Deborah Popper have a solution: create a Buffalo Commons by returning 139,000 square miles in ten states to prairie and reintroducing the buffalo that once roamed there.